Traditionally bright red with a French frill, growing primly upwards or gracefully hanging, there are over 600 different types of geranium that all bloom lavishly. The geranium may well be the best-known flower. It can be found in all regions that have a moderate climate, and has been very popular for centuries. As a garden bloomer it is a beauty with gorgeous green leaves and fabulous flowers in bright red and brilliant white, but also bright pink, purple, orange, lilac, striped and very rich dark red. The bowl or plate-shaped flowers consist of five petals. One typical characteristic are the long ‘beaks’ on the fruit with which the seed is catapulted away as soon as it’s ripe. The choice of leaves, colours and flower shapes - single, semi-double and double-flowered - is enormous. 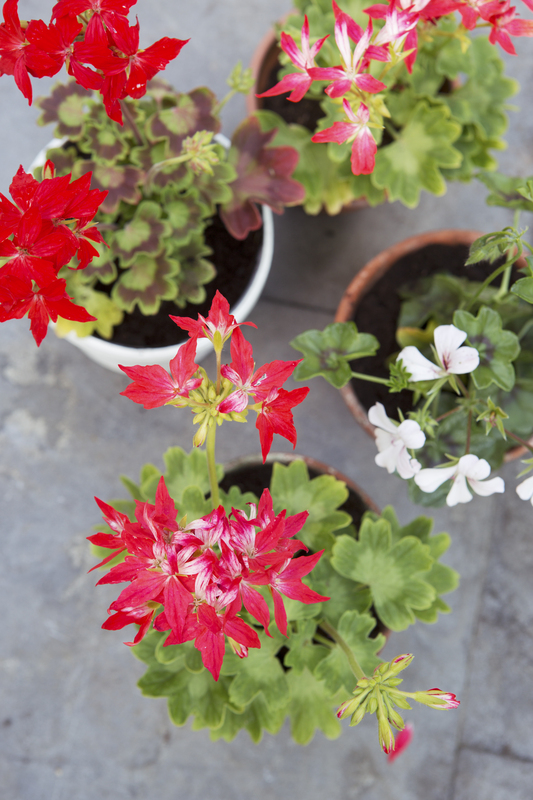 There are geraniums that can reach a height of one metre, but also creeping groundcover which only grows to a height of 10cm and hanging varieties which can easily reach a length of 30cm. The geranium is a fairly strong plant which thrives both in cool, northern summers and warm, southern ones. You can enjoy it for three whole seasons every year with varieties which flower as early as March, and others which produce flowers until well into the autumn. This makes geraniums a regular fixture in European beds, pots, containers and hanging baskets. On their own, they offer a spectacular and diverse display of flowers, but geraniums are also great team players in mixed company. Geraniums are native to Namibia and South Africa, although those wild plants don't look much like the lavish hybrids that are available here. The geranium came north in around 1600 on Dutch East Indies Company ships and was initially reserved for the nobility as a bloomer in orangeries. However, because it’s relatively easy to take cuttings from geraniums, the plant rapidly spread to the wider public. Initially, there were only red and white geraniums; the variation in colour developed later. Ever since Linnaeus classified the plant incorrectly in 1753 there has been confusion about whether it’s called Geranium or Pelargonium. The first is a reasonably frost-proof perennial; the second is an annual which cannot cope with the cold in our climate, unless it can hibernate indoors. There are other differences and there’s always room for a little more confusion! The geranium is also known as ‘storksbill’ and the pelargonium is called ‘geranium’. Botanical purists believe that it should be pelargonium, but in practice most people have been stubbornly referring to it as a geranium for three centuries. Either works! The name comes from the Greek word ‘géranos’, which means ‘crane’; the flower resembles this bird slightly. The characteristic scent of geraniums is a popular ingredient for opulent perfumes. In the language of flowers the rose geranium symbolises an unexpected meeting, and the Regal Pelargonium is a sign of true friendship. Geraniums generally enjoy a couple of hours of sun a day, and the remainder in partial shade. It’s worth checking the variety. There are geraniums that can tolerate shade, but there are also real sun worshippers. Most varieties will do fine in normal potting soil. Give plenty of water every other day, particularly on summer days, but the water has to be able to drain: geraniums do not like wet feet, it causes their leaves to yellow. Removing exhausted flowers ensures optimal new flower development.